Our Simultaneous 5-Axis Machining aims at realizing high-quality surface finish by controlling the rotation axes smoothly with minimum change of the tilt axes. In our Simultaneous 5Axis Machining, 3-axis cutter paths are converted into Simultaneous 5-axis cutter paths by a “5-axis conversion function”. This is a mechanism of attaching tool vector data without changing the cutter locus. 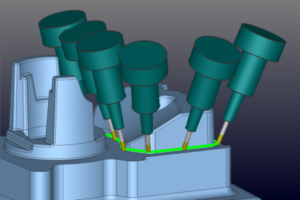 This method does not require any specific skill of Simultaneous 5-Axis Machining that has been considered a burden on operators, and it is possible to generate efficient cutter paths. 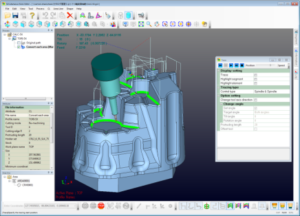 Creates 5-Axis Simultaneous tool paths, by adding the information about tool direction to 3-axis tool paths. In converting tool paths, “smoothing control”(Youtube) adjusts the tilt axis and rotation axis to make the Machine Tool move more smoothly. It is also possible to have the tool tilt gradually before the point where the tool direction changes rapidly. These functions provide high-quality finished surfaces. Collision of Tool, Chuck and Holder with the shape can be avoided by controlling tilting axis automatically. Change tool direction gradually to avoid drastic change of tool direction. It minimizes the cutting mark.